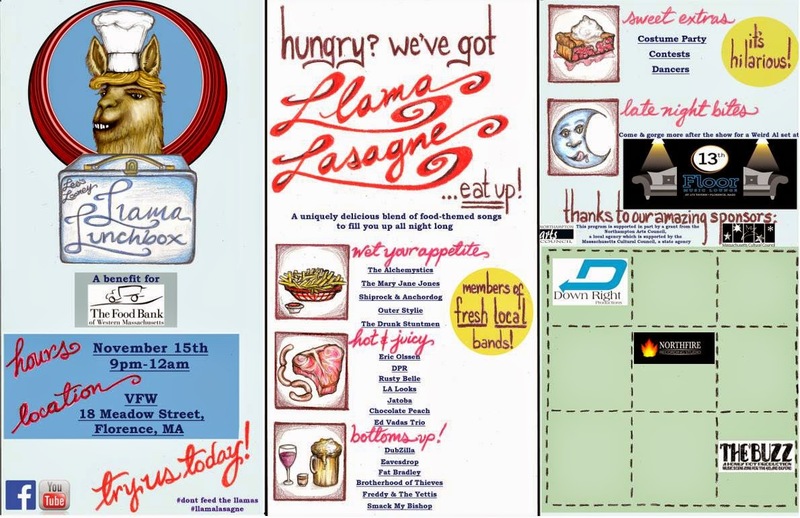 Llama Lasagne is an ever evolving circus of Pioneer Valley musicians, artists, and business that strive to encourage collaboration and cross promotion among Pioneer Valley artists via bi-annual theme-based stage performances with a charitable goal. 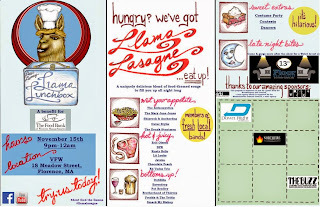 Strangers Helping Strangers will be hosting a Canned Food Drive for the Food Bank of Western MA! Some of the most-needed items for canned food drives include: canned products such as fruit, pasta/ravioli, beans, vegetables, or tuna fish; rice and pasta; healthy snacks such as granola bars; peanut butter and jelly; and cereal. No glass jars, please. Did you know that in Berkshire, Franklin, Hampden and Hampshire Counties in Western Massachusetts, approximately 1 in every 8 people suffers from chronic food shortages or needs emergency food assistance? In some areas, rates of hunger and food insecurity are more than 6x higher than the Massachusetts statewide average. Expect the most ridiculous, and we'll possibly top it!